Get some cultural insight at Defence of Darwin Experience and Darwin Aviation Museum. Step out of the city life by going to Nature & Wildlife Tours and Crocosaurus Cove. Change things up with a short trip to Territory Wildlife Park in Berry Springs (about 42 minutes away). There's lots more to do: see the interesting displays at Museum & Art Gallery of the Northern Territory, get engrossed in the history at RFDS Darwin Tourist Facility, explore the galleries of Mason Gallery, and make a splash at Wave Lagoon. To see where to stay, photos, reviews, and more tourist information, read our Darwin trip itinerary website . Brisbane to Darwin is an approximately 6-hour flight. You can also drive; or take a bus. Expect somewhat warmer temperatures when traveling from Brisbane in June; daily highs in Darwin reach 36°C and lows reach 24°C. Finish up your sightseeing early on the 29th (Sat) so you can go by car to Jabiru (Kakadu National Park). Jabiru is a town in the Northern Territory of Australia. 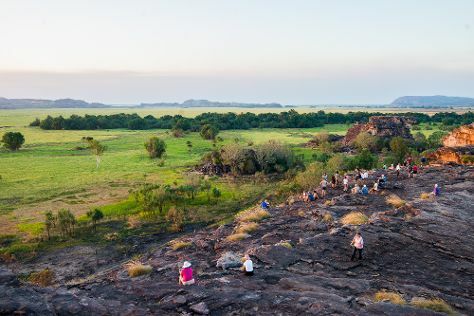 Popular historic sites such as Nourlangie Rock and Ubirr are in your itinerary. Your cultural itinerary includes sights like Maguk Gorge and Anbangbang Billabong. Spend the 4th (Thu) exploring nature at Jarrangbarnmi / Koolpin Gorge. And it doesn't end there: see the interesting displays at Warradjan Cultural Centre, look for all kinds of wild species at Cahills Crossing, take in the dramatic scenery at Motor Car Falls, and don't miss a visit to Bardedjilidji Walk. For maps, reviews, traveler tips, and more tourist information, read Jabiru (Kakadu National Park) itinerary planner. Getting from Darwin to Jabiru (Kakadu National Park) by car takes about 2.5 hours. Other options: take a bus. Wrap up your sightseeing on the 4th (Thu) early enough to travel to Mary River National Park. Kick off your visit on the 5th (Fri): explore the wealth of natural beauty at Mary River National Park. To see maps, more things to do, traveler tips, and more tourist information, use the Mary River National Park trip itinerary site . Traveling by car from Jabiru (Kakadu National Park) to Mary River National Park takes 2.5 hours. In July, daytime highs in Mary River National Park are 36°C, while nighttime lows are 22°C. Finish up your sightseeing early on the 5th (Fri) so you can travel to Adelaide River. Adelaide River is a small but historically significant town located at the crossing of the Stuart Highway over the Adelaide River in the Northern Territory of Australia. Kick off your visit on the 6th (Sat): examine the collection at Adelaide River Railway Museum, take in the dramatic scenery at Robin Falls, then stroll the grounds of Adelaide River War Cemetery, and finally snap pictures at Adelaide River Railway Bridg. To see photos and more tourist information, you can read our Adelaide River tour itinerary planner. You can drive from Mary River National Park to Adelaide River in 3 hours. In July, daytime highs in Adelaide River are 36°C, while nighttime lows are 22°C. Cap off your sightseeing on the 6th (Sat) early enough to travel to Batchelor. On the 7th (Sun), explore the striking landscape of Litchfield National Park. 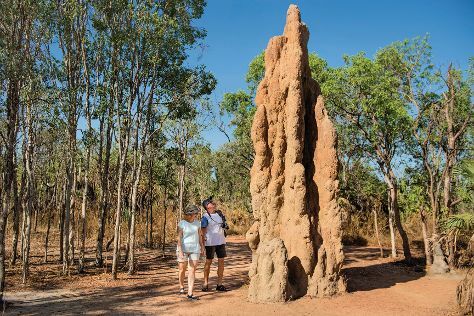 On your second day here, take in the dramatic scenery at Florence Falls and then take in the dramatic natural features at Magnetic Termite Mounds. Make your Batchelor itinerary with Inspirock to find out what to see and where to go. Batchelor is just a short distance from Adelaide River. In July in Batchelor, expect temperatures between 36°C during the day and 22°C at night. Finish your sightseeing early on the 8th (Mon) to allow enough time to travel back home.